Gross Weight (GVWR) 15785 lbs. 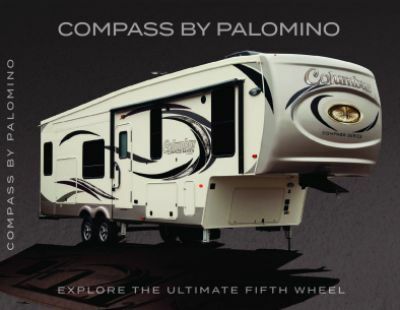 Feel at home wherever you go with the 2020 Palomino Columbus Compass Series 374BHC 5th Wheel! All Seasons RV is one of the largest RV dealerships in Michigan. We have been for years. That's because we're rated #1 in customer satisfaction, with fast, easy financing, and a courteous, professional, and knowledgeable staff! We've got an unbelievable inventory of all the top RV brands and models at prices that will amaze you! So stop in and see us today at 4701 Airline Rd Muskegon Michigan 49444 and let us show you how easily you can own your dream RV! Even if you don't live in Muskegon or Michigan, our fast, reliable door-to-door delivery service means you can visit us online, pick out your perfect RV, and see it in your driveway tomorrow! Give us a call at 231-739-5269 and make your RV dream come true! Protect camping chairs and picnic tables from the elements with the 16' 0" awning. This rig has a GVWR of 15785 lbs. and a hitch weight of 2357 lbs. Whether you have a big family or a lot of friends, you'll have room for them all, thanks to the 4 easy open slides that maximize the living space of this 42' 1" long and 8' 5" wide RV! Even when the weather forces everyone inside, they can stretch out comfortably and stay cool and easy thanks to the efficient 15000 BTU a/c unit or feel toasty and warm from the modern 35000 BTU furnace! Bring the coziness of home with you on your travels! Sleep well in peace and comfort in the bedroom, with its lovely Queen bed! Up to 7 people can snuggle in and get a good night's rest in this cozy camper! With the kitchen's 8.00 cu. ft. refrigerator, you can enjoy fresh food throughout the entire trip. There is also a 3 burner range cooktop and a sink with clean water provided by the 75 gallon freshwater tank. Don't trust that the communal bathroom will be anything but disgusting! Enjoy your own personal bathroom, with a Porcelain Foot Flush toilet and a shower inside! With 60 lbs. of LP tank capacity heating the water, you'll be able to enjoy long, hot showers all vacation long! The 71 gallon gray water tank and the 78 gallon black water tank discreetly store dirty water and waste, so you won't have to see or smell it! 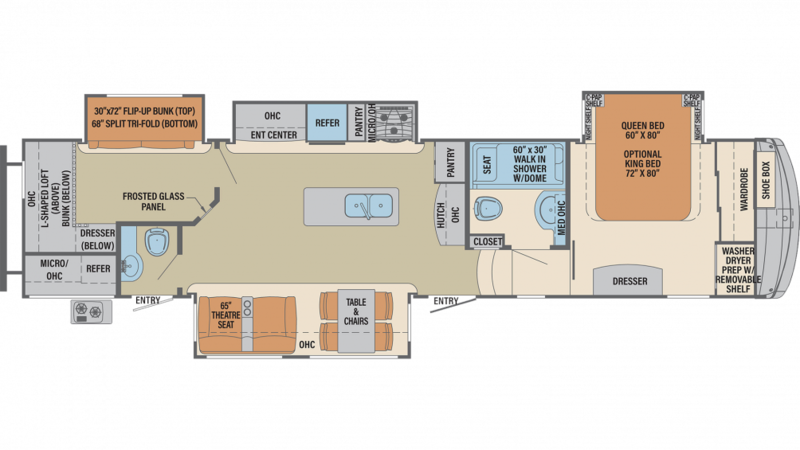 With the extra comfortable Bunkbeds inside the bunkhouse, this RV holds 4 beds. When the fun and fresh air outside are just too enjoyable to leave, why go indoors to cook a meal? That's won't ever be a problem with the handy outdoor kitchen!